If you’re based in the Manchester area , then why not trust Any Waste. to take care of all of your waste disposal needs? Give us a call on insert phone number or get in touch with us through the site to get started – we’ll go through your requirements and give you a quote straight away! We pride ourselves on being the best at what we do, using our experience and expertise to get the job done as quickly, safely and cleanly as possible. All of our operatives are fully trained and have been vetted to make sure that they fit the bill, providing a friendly and efficient service that you’re sure to love. We receive your initial enquiry and then ask a series of questions regarding your rubbish clearance needs – don’t worry, we’re quick and the call usually won’t take any longer than five minutes, so you can be on your way in no time! We try to establish your requirements and then offer a no obligation quote there and then, no messing about. We provide a non-fixed estimate over the phone based on the weight, size and quantity of your rubbish – so you will know straight away how much you will be spending, no hidden costs and no nasty surprises. Once we have given a quote and you are happy to go ahead, we book in a time and date that is suitable to you for the collection to take place. When our operatives arrive, they give a more informed estimate based on the amount of waste that is on hand. Once the finer details are sorted out, our friendly and skilled professionals get to work loading your rubbish into one of our vans. So you can sit back and relax while we do all the hard work! Once the rubbish is on board the van and we have cleaned up, we then give you a call to take a credit or debit card payment over the phone. We only use trusted and secure payment gateways so you can rest easy knowing that your details are safe with us. We also accept cash on completion. When your job has been carried out and payment has been made, we will send over a full receipt for your records. As you can see, our process is straight forward and transparent – we like to be on the same page as our customers and we do our best to make sure that each job is carried out perfectly and to your satisfaction. Ready to get started? Why not give us a call or get in contact with us via our website or email address? At Any Waste we understand that you don't want to get your hands dirty and sometimes you want an expert team to come in perform rubbish clearance. 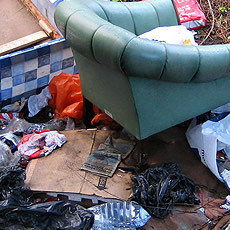 Did you know that you can now just simply photograph your rubbish with your phone and text it to us on 0800 138 9100. You can make your booking here. Please note: You are responsible for your waste from the point of production until it reaches the point of final disposal. Now covering: Altrincham, Wilmslow, Chorlton, Levenshulme, Didsbury Village, Burnage, Salford Quays, Castlefield and Deansgate. We pride ourselves on being the best at what we do, using our experience and expertise to get the job done as quickly, safely and cleanly as possible. All of our operatives are fully trained and have been vetted to make sure that they fit the bill, providing a friendly and efficient service that you’re sure to love.